Here are the Sydney solar power installers that are in the New South Wales SolarQuotes network. To get free quotes from 3 of these installers, simply enter your postcode in the box up the top and press the big red button. Or if you want to learn everything you need to know about installing solar panels in Sydney (and I mean everything) simply scroll below the table. Sydney’s climate is quite pleasant. Summers are warm with an average high of 25.9°C in January, while winters are mildly cool with an average low of 8.1°C in July. Rainfall is fairly constant through the year and usually sufficient to keep the city looking green. However, Sydney’s climate may be growing drier as a result of global warming. Solar panels on a typical north facing roof in Sydney will receive an average amount of sunlight energy equal to about 4.8 hours of full noon sunshine a day. While this is less than the state capitals of Perth, Brisbane, and Adelaide, Sydney still beats Melbourne and Hobart when it comes to insolation. A new 5 kilowatt solar system on a north facing roof in Sydney could be expected to produce an average of around 19.4 kilowatt-hours a day or 7,070 kilowatt-hours a year. The majority of roofs in Australia have a pitch of either 15 or 22.5 degrees. But Sydney also has many homes with steeper roofs of 30 degrees or more. There is very little difference in output over a year between a shallow 15 degree roof and a steep 45 degree roof. Shallow roofs provide a mild advantage to households that have high summer air conditioning demand, while steeper roofs provide a mild advantage to those who use more electricity on winter days. Compared to panels on a shallow 15 degree roof, those on a steep 45 degree roof will produce around 18% less electricity in Sydney in January and 22% more in July. .
North facing solar panels in Sydney will produce the most electricity, but placing modules facing east or west can certainly be worthwhile, especially if they increase a household’s self consumption of solar electricity. Panels facing directly east or west will produce almost 20% less electricity than north facing panels over a year. East facing panels will produce more electricity in the morning, while west facing ones produce more in the afternoon. East facing panels will produce slightly more electricity than west facing ones because mornings are cooler than afternoons and heat reduces the efficiency at which solar panels operate. This table shows you how a combination of roof direction and tilt will affect your solar electricity output in Sydney. It shows the energy yield for your chosen orientation relative to the optimum orientation for Sydney which is north facing and 35 degrees. 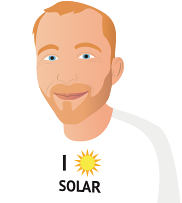 I strongly recommend having your installer guide you through the application process for rooftop PV. In some areas network operators request that you contact them first, but that does not appear to be the case in Sydney. Sydney has two Network Operators, Ausgrid and Endeavor, that are responsible for the distribution of grid electricity to homes and business. The Endeavor Network area is comprised of the western suburbs which include Hawkesbury, Baulkham Hills, Parramatta, Fairfield, Liverpool, and Campbelltown. The Ausgrid Network area consists of all parts of Sydney east of these suburbs. Sydney households can install up to 4.99 kilowatts of rooftop PV if they have single phase power. In the Ausgrid network area this maximum is determined by the size of the inverter, while in the Endeavor network area it is determined by both the size of the inverter and the total capacity of the solar panels. This means it is possible for a home in the Ausgrid area with single phase power to have 5 or more kilowatts of solar panels provided its inverter is under 5 kilowatts. In the Endeavor area both the inverter and the total solar panel capacity must be under 5 kilowatts. Households with 3 phase power can install up to 30 kilowatts of rooftop solar power before special protective equipment needs to be installed, but council permission will be required to install more than 10 kilowatts. A Sydney household of 3 people without a gas connection will use an average of around 6,940 kilowatt-hours a year. The average Sydney home uses 34% more electricity in winter than summer. Sydney’s electricity prices are moderate to low by Australian standards. Including GST, grid electricity averages around 22 cents a kilowatt-hour with a typical daily supply charge of around 73 cents. A Sydney household without a rooftop solar power system that uses 6,940 kilowatt-hours and has a plan that gives them a 10% discount would pay around $1,610 a year. Feed-in tariffs are a payment for surplus electricity produced by rooftop solar that isn’t used by the household or business but is instead sent into the grid. In Sydney and across NSW, the feed-in tariffs available depend on what is offered by electricity retailers. Feed-in tariffs, in cents per kilowatt-hour, offered by retailers as of May 1st 2016 range from 5 cents up to 10 cents. Just which is the best plan to use depends upon individual circumstances. 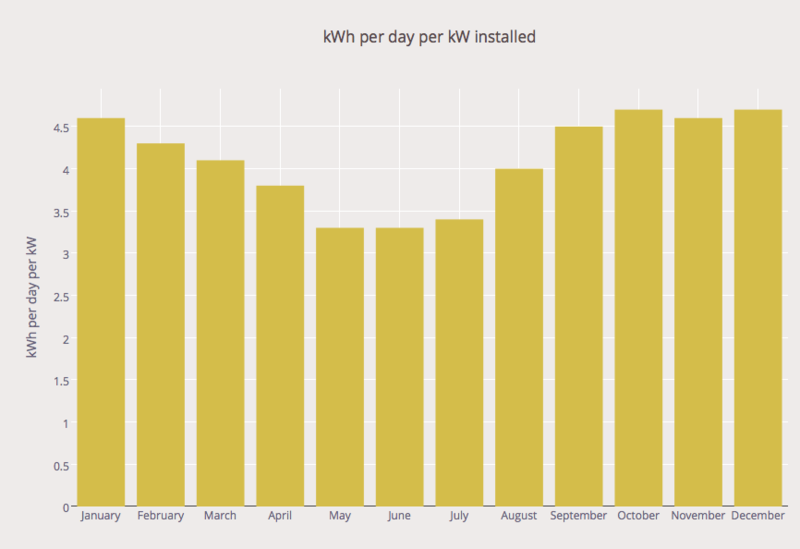 Electricity retailer plans can be compared using SolarQuotes’ electricity price comparison tool. It allows you to enter your previous bill’s details and predicts how much various retailers would have charged for the same usage and provides information on the feed-in tariffs they offer. A Sydney family that installs three kilowatts of north facing rooftop PV and self consumes half of the electricity it produces and has a 6 cent feed-in tariff can expect to reduce their electricity bills by around $550 a year. All else equal, with a 10 cent feed-in tariff they could expect to save around $640. Note however, as electricity plans differ in their details, all else may not be equal. From around the 15th of December to the 30th of January, thanks to daylight savings time, the sun doesn’t set until after 8:00 pm in Sydney. This is useful for powering air conditioners in the late afternoon with solar electricity, especially when using west or north-west facing panels. Sydney’s leafiest suburbs, Pittwater, Warringah and Ku-ring-gai have over 50% tree cover and are the most likely locations where trees will shade roofs for a portion of the day, especially in winter when shadows are longer. The use of microinverters or DC optimisers can help limit the loss of solar panel output caused by shading. Many Sydney households and business can benefit from solar installations where the solar panels have a total capacity greater than that of their inverter. This will result in some loss of output from the solar panels when the sky is clear and the sun is high in the sky, but will cause greater output when the sun is low or skies are overcast. This results in a smoother production of solar electricity through the day which can help increase a household’s self consumption, which is very useful for improving the economic payback of rooftop solar power. A rooftop solar system’s total panel capacity can be up to one third larger than the size of its inverter and still receive the full amount of STCs which lower the cost of installing solar power. This reduction is often referred to as the solar rebate. Technically it’s not a rebate, but many people don’t care and call it that anyway. The solar rebate will be reduced on the first of January each year until it ends in 2030, so the earlier a system is installed, the greater the rebate that will be received. In the Ausgrid network area in Sydney, the maximum system size allowed is determined by size of the inverter which must be less than 5 kilowatts for a home with single phase power. However, the total capacity of the solar panels can exceed this and be 5 kilowatts or greater. So a 4.2 kilowatt inverter could be installed with 5.6 kilowatts of solar panels. In Sydney’s Endeavor network area, the maximum system size allowed is determined by the size of the inverter and the total capacity of the solar panels for homes with single phase power. This means that a 4.2 kilowatt inverter could not have more than 4.99 kilowatts of solar panels. If 250 watt solar panels were being used then a maximum of 4.75 kilowatts of panels could be installed. An import/export electricity meter will need to be installed when rooftop solar power is added to a home in Sydney. Most reputable installers will handle this themselves and include its cost, along with that of any required upgrading of your switchboard in their quote. However, some installers do not change meters, so be sure to check whether or not this is covered. If you have an older switchboard with fuses rather than circuit breakers this will need to be upgraded. This could potentially cost $1,400 or more. NSW has more than 417,00 small scale solar power installations, but the state considerably behind SA, QLD, and WA in solar installations per person. Solar electricity generated in Sydney will mostly displace black coal generation in NSW, along with a smaller amount of natural gas generation. This makes rooftop solar in Sydney very effective at reducing greenhouse gas emissions. The high voltage, long distance transmission lines that deliver grid electricity to Sydney are managed by Transgrid. Starting on the 16th of December 2015, in return for $10.258 billion, Transgrid is being leased for 99 years by a consortium called NSW Electricity Networks.